Review Ver 2.0: All Pieces Included. Update: Due to a packaging error, our sealed retail Disney Infinity Starter Pack didn't ship with a key component: the three-sided Play Set Disc that provided a trio of sandbox worlds for the player to enjoy immediately. Which is obviously a huge part of the game, and adds to the pack's value massively. The perceived bare-bones nature of the Starter Park was our biggest bone of contention with the original review and heavily influenced the score. As a result, we've pulled both: here's a new version of the review, taking into account that Play Set inclusion. In a generation in which content is packaged and sold as additional DLC to your initial game purchase, the issue of percieved value is heavily subjective. In that regard, before we even talk quality of gameplay, Disney Infinity's offering will be divisive. Like Activision's Skylanders, Disney Infinity divides up its in-game content across physical figurines and plastic Discs. Chips hidden inside each stores everything from a sandbox world, a virtual avatar, single level or in-game item. Once dropped onto the board-like Infinity Base, that piece's content is loaded up into the game. You can swop between characters at any time simply by switching their physical figures on the Infinity Base. The idea is the marriage of collectable toy and game DLC. Skylanders, with its similar execution, has proven a huge success. Little wonder that Disney, with its iconic range of brands, would want to replicate the concept. Disney Infinity's being sold as a long-term platform, onto which the company's future (and past) films and franchises can be built upon and bolted onto. On offer come launch are recent Pixar and live-action movie characters turned toys: casts from The Incredibles, Monsters University, Cars, Pirates of the Caribbean, The Lone Ranger, are all represented. The Starter Pack, which includes Infinity Base, three figures (Sulley, Jack Sparrow, Mr. Incredible), a three-sided Play Set Disc, one randomised item Disc, and retail game, costs £59.99. What that gives you immediate access to is, on the retail disc alone, are a series of training levels introducing you to the world, a set of generic Adventures built around shooting, exploring and racing, and Toy Box. That last is Disney's world editor, letting you build levels from content you gradually unlock through playing the game. Toy Box also allows you to mix and match any character or item you own. Most of the Toy Box content is hidden behind a randomised unlock mini-game. Sadly that includes the most interesting gadgets, Creativi-Toys, simple programmable devices that are key to building your own game types, which has been a gameplay headline of the title ever since its reveal. Each figure comes in-built with a time-based mini-adventure. Both these and the in-game generic Adventures you'll chew through quickly. So that leaves the real meat of immediate gameplay to the Play Sets. You've the one three-sided version that comes with the Starter Pack, three Sets in one. And what's contained on the disc is hugely impressive. The game's development studio, Avalanche Software, have pedigree. Responsible for the best movie - kids' movie - tie-ins over recent years, they've shown that as much as Pixar don't make films just for children, the developer's work (on both Cars 2 and Toy Story 3) proved you can have enjoyment and depth in titles aimed at tykes. The Disney Infinity creator is to be commended in taking Disney's diverse cast of characters and unified them all into a singular, entertaining, gameplay experience. Aside from the odd special attack, all characters perform the same moves, have the same controls - but still feel, talk and move like their movie counterparts. And that attention to detail's clear to see in each of the Play Sets. Each movie-based Adventure, huge sandbox worlds full of missions and challenges, can only be played by the characters of that particular franchise (cast-swopping is limited to Toy Box). 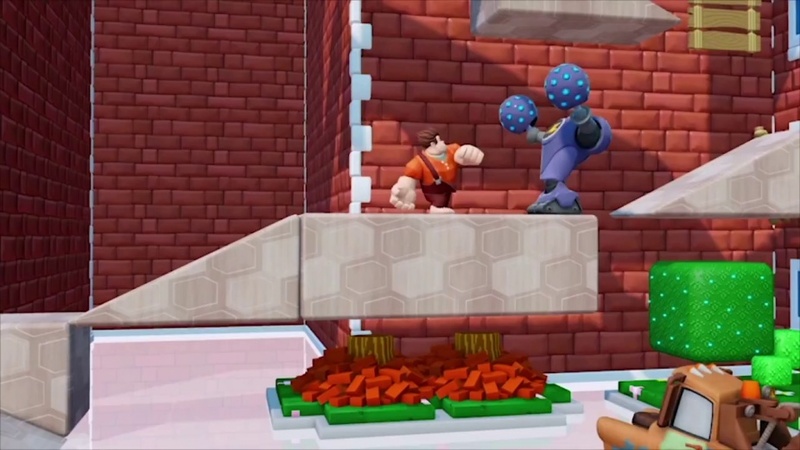 You can see how creators have expanded massively from the original concept of big open areas from their work on Toy Story 3 - most so in the Pirates of the Caribbean Play Set, which is like a pint-sized Assassin's Creed IV world of open sea, piracy and explorable islands, but doesn't skimp on gameplay or spectacle. You can upgrade your ship, discover treasure, go sword-fighting... and we doubt you'll be unable to hold back a gasp when you see the monstrous Kraken surface and churn the sea in its wake. It's impressive stuff. On the strength of Captain Jack Sparrow's adventure alone, Disney Infinity has raised the bar for any other children movie tie-ins in future. Whereas the Lego tie-ins played it funny and cute, Disney Infinity's double act is humour and Disney magic. The Incredibles offers training grounds for super heroes amidst a small but dense metropolis, filled with robots to punch (not to mention collateral damage, if you fancy a re-run of arcade classic Rampage) . In Monster University, you'll be scaring and pranking rival students. Avalanche manage to nail the vibe of three very different movies and make each feel like a full experience in their own right. There's enough content here to tide you over for a while. You can pick up additional single Play Sets (bundled with two figures) separately at £34.99 a pop. Reason you're approaching near the full price of a separate retail titles is because that's essentially what the Play Sets give you: a full gameplay experience, each themed around a particular franchise and offering a generous double-figure number of missions and multiple challenges to try. While the foundations are the same for each Set - sandbox world, missions offering varied gameplay - the quality does varies. We tried The Long Ranger and Cars Play Sets as well for review. The former, with its Wild West setting, was built around train robberies, Indian reservations and shoot-outs, and was really good fun. Cars and its missions felt lacking in comparison, but thanks to the four-wheeled mechanics from Cars 2 - Avalanche Software's great video-game tie-in racer - being carried over to Infinity, there's still enjoyment to be had. (And being able to pull the same car tricks while driving in The Incredibles Play Set is the kind of crossover we like to see). That said, earning gold in the figurines' time-based mini-adventures is surprisingly hard, and in particular Mr.Incredible's seems unfairly so. We question whether that difficulty's been skewed such to extend the lifespan of each character Disc's mission. We didn't want a walkover, but neither did we expect such frustration either. But while the Play Sets are great for loosing yourself in, they're only one of two key pillars to the concept. The second is Toy Box. Open up this mode and you start with a blank, single square of grassy terrain. With a button press you go from character view to Editor view, an overview of the world, with your unlocked items listed on a easily navigable HUD. Unlocking items involves firstly collecting Infinity Points during Adventures. They're relatively quick to pick up, and as they're built into playing through the Play Sets, it never devolves into a grind. Each Point allows you a single go on the Infinity Vault, a massive randomised pick n mix machine that'll select a figure, pack, or item at random each time. It's akin to closing your eyes and plunging your hand into a bucket of Lego. You'll likely not get what you want, but it forces you to make do with what you get; and that's not a bad way to push you into experimenting in Toy Box. For the most it feels rewarding rather than a grind, and you do get a kick when you get something iconic; Aladdin's Cave of Wonders, or Carl's balloon house from Up. The Editor works smoothly, letting you stack and move environments or objects in a variety of different overhead view points, or switch back to character view in a flash, and use a wand to quickly grab a specific piece to move. There are niggles. There's no "snap to" option, leaving a chance for gaps, nor can you merge environments. You're stuck with hills, tracks or the like exactly as they're designed, nor can you rotate them more precisely than a 90 degree standard. It's less of an issue than you think, given the target audience for the game. But when you start think of it like that, you find more to fault. From simple things like new unlocked materials not being highlighted in the menu, to bigger issues like a lack of proper tutorials. The few right at the game's start are brief; having some on offer with a quick button press for each step of Toy Box would have been, well, a great help. Because there's some things we're still unsure of how to do, and that leads us onto the next point. As we said, the Creativi-Toys, triggers, switches, cameras and the like, can potentially turn your Toy Box into a 2D platformer, or top-down RPG. We saw some real impressive stuff when the game was demoed on its reveal. The potential is massive. Those are the few big problems the game has. There's a small list of minor niggles (such as character dialogue, while snappy. Sometimes talking over the narrator, outside the Editor, the HUD menus being functional and lacking the Disney flair), but the good stuff outweighs those minor quibbles. Each figurine's chip saves their progression, giving you another reason to skip between characters and Play Sets to balance XP share, and you can use toys on any Infinity Base, regardless of console. And the game retains its sense of humour; either through character-accurate dialogue, or those stupid things you won't get bored of, like picking up civilians and punting them with a drop kick across the Toy Box (toss em off a cliff, and they'll deploy parachutes). Control feels great, whether on foot or in vehicle (or our favourite, on horse), and there's simple Prince of Persia-style mechanics to level navigation. On that matter, four-wheeled characters get shortest thrift, making travelling anywhere outside wide open spaces or race tracks difficult. You can also tell that now they've got the platform built and foundations in place, the development team are going to have a lot more fun inventing worlds and gameplay. There's a solid idea behind all this, and moving forward we'd like to see what they can do with other Disney properties - be it spandex-wearing super heroes or Galaxies Far, Far Away. We can't argue with the gameplay; Avalanche Software continue its pedigree of enjoyable Disney tie-ins. The figurine mini-games aren't the best, but they're a nice addition to have. But even if the continued costs are going to be heavy on the wallet (£29.99 for a character three-pack, £14.99 for a single one, £3.99 for two randomised item Discs, £34.99 for a new world to play in, and two characters to play with) there's enough in the Starter Pack to keep you immersed in the game while you're saving for your next Play Set. And since the gameplay - no matter what world you're invested in - is enjoyable (and you've three to dig into), even the irksome issue of locked content in Toy Box will be solved painlessly enough given time. trackmonk on the 18th of August 2013 at 20:13. Pali on the 18th of August 2013 at 23:43. Show some integrity and re-review the game after you have actually played it. There are 3 playsets in the starter pack. Toys are also unlocked in the Toybox as you progress through these playsets. Perhaps that is part of your problem. Baltharan on the 19th of August 2013 at 10:57.